is China the fairest of them all? Post-1997 Hong Kong is an open and fairly “free” commercial juggernaut captained by kowtowing bureaucrats resolutely pointed towards Beijing. What does this portend for local freedoms? 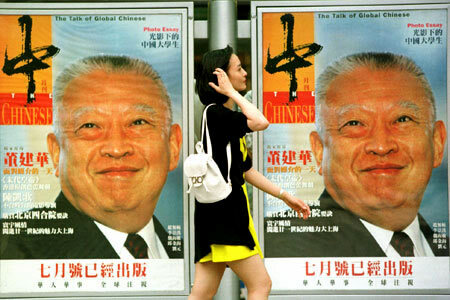 VISITORS to Hong Kong often ask what has changed since the handover of power in 1997. The implied question is, are things better or worse? Lamentably, after fourteen years under Chinese sovereignty it remains impossible to give a clear cut answer. Most of the wildest and more idiotic predications of doom have proved unfounded. It was, for example, said that political dissidents in Hong Kong would be locked up. Then there were the fears that vast sums of money would be carted away from the bulging coffers of the Hong Kong government to find a new home in Beijing. More vivid were predictions that soldiers belonging to the People’s Liberation Army garrison stationed in Hong Kong would be highly visible and cast an intimidating shadow over the people of the newly ‘liberated’ territory. Let’s look at these predictions one-by-one: first, there has been no wholesale deportation of Hong Kong dissidents to the gulag that houses the world’s highest number of political prisoners. Secondly, instead of a massive flow of funds from Hong Kong to the Chinese Mainland, the flow has gone entirely the other way, albeit not from government coffers but from private investors. And thirdly, the PLA has proved to be near invisible, apart from a few set-piece military parades and flag raising ceremonies. So, does this mean that there was and is nothing to worry about? The emphatic answer is no; not because the new sovereign power has defied the worst fears and even less because it has turned out to be a force for good. The reality of change is very complex and defies pat explanations. To understand what has happened is to comprehend just how unusual is the state of affairs that prevails in Hong Kong (and, it should be added, to a lesser extent in Macau). Never before in modern history has the end of a colonial era been characterised by what amounts to the transfer of one colonial system for another. Generally speaking the departure of colonial powers comes at the end of a long period of violent struggle. In the instances where there was no uprising against the colonial power, their departure was usually accompanied by a great deal of discontent (as in the case of the nations shoe-horned into the deceased Soviet Union). In some isolated cases, Armenia comes to mind as a prime example, a number of foreign nations seized this embattled land and only parts of it have achieved a semblance of self government. Most importantly, however, the Armenian spirit was never extinguished and, although full independence has not been achieved, the struggle continues. In Hong Kong there was no struggle for independence and the population meekly accepted the transfer of sovereignty in a process from which they were excluded. Hong Kong is bizarre on a number of levels. For a start it is largely populated by people who willingly fled from their own nation to live under a foreign flag in an adjacent territory. Secondly, Hong Kong was the only part of Chinese territory to be ceded for a fixed period to foreign rule (pedants will point out that Hong Kong island was ceded in perpetuity but the rest of the territory was on a fixed term lease). This leasing arrangement survived four tumultuous changes of regime on the Chinese mainland (Manchu rule, Nationalist rule, Japanese occupation and Communist rule) and ended according to schedule. Thirdly, the Hong Kong Chinese elite proved to be unusually compliant in serving the interests of their colonial masters. When the brief Japanese occupation was underway, members of the elite class quickly shed their British garb and rushed to embrace the new rulers and when the Japanese were expelled they resumed their embrace of their British colonial rulers with only the smallest blink of an eye. Then, in the 1980s when it became clear that the territory was to be returned to Chinese rule, members of the local elite could barely contain their enthusiasm for rushing up to Beijing to declare their undying loyalty to the new regime. Being a largely immigrant society, the bulk of the people did not get themselves involved in politics but concentrated on survival and making better a life for their children who, only in the 1980s, formed the majority of the population, thus transforming Hong Kong from being a place of immigration to a place of people who had known no other home. The implications of this, as we shall see, are enormous. This, then, is the context within which a new order came into being on 1 July 1997. The British colonial rulers departed with a great deal of ceremony and there was much hypocritical talk by the then prime minister, Tony Blair, about how Hong Kong would not be forgotten. The words were barely out of his mouth before British attention shifted away from its former colonial possession with what looked suspiciously like a sigh of relief. The incoming rulers were well aware that the eyes of the world were upon them. China was emerging from its international diplomatic cocoon and keen to make a good impression. Partly for this reason care was taken to provide reassurance that the new Hong Kong would enjoy considerable leeway in pursuing its system of life and government that was so very different from that prevailing in the one-party state across the border; a border that remained in place with all the paraphernalia of a foreign country border crossing. What the rulers in Beijing had not fully appreciated was the almost abject sycophancy of the Hong Kong elite and its keenness to prove loyalty to the new regime by anticipating and eagerly embracing characteristics of the one-party state to an extent that even the Communist Party had not planned for Hong Kong. The Chinese government, of course, had no idea how to run a society enjoying a high degree of liberty and bought the line that all Hong Kong people wanted was money and more money. As long as prosperity could be maintained, well, heck, nothing else was going to matter – went their thinking. Symbolising this line of thought the new head of the Hong Kong government was given the business-sounding title of Chief Executive and a former shipping tycoon, Tung Chee-hwa, was chosen for the job. Tung carried a lot of political baggage, mainly his family’s long association with the Nationalist government in Taiwan, and so he had to strain every sinew in his body to prove that his loyalties had switched. No one could have guessed that he would turn out to be quite so incompetent as head of government, so indecisive, so incapable of delegation and so keen to bother officials in Beijing for guidance on even the smallest decision. Finally Tung was removed but not before introducing a disturbing element of paralysis into the system of government. Had he been backed by highly competent officials who could make up for his deficiencies, the consequences might have been mitigated. However a cruel legacy of the colonial regime was to leave behind a cadre of civil servants adept at taking orders but shorn of initiative. When it finally became clear that Tung had to go in 2005, ostensibly for health reasons, the Chinese government, albeit with the window dressing of another phony election, decided that he should be replaced not by a businessman but by a bureaucrat who really knew the system. The ‘mandate of heaven’ was then bestowed on the unlikely shoulders of Donald Tsang, the meek son of a policeman who had eagerly angled for a British knighthood at the very last moment of British rule. Most people thought this ruled Tsang out of contention for any kind of promotion in the new order even though he was then occupying the third ranking post in the government. But they were wrong and quite underestimated Tsang’s ambition and determination. He let the new rulers know that he would be more loyal than the most loyal and that because he knew how the system worked he could make it work better. The big bosses bought Tsang’s story and, even though they appreciated that he might not be the brightest and the best, he was the best they could get for the time being. What rapidly became clear was that although Tsang knew how to work the system he was quite devoid of ideas and, with an entirely bureaucratic mindset, failed to appreciate the demands of a rapidly maturing society. What Tsang could not see and the Chinese authorities did not want to see was that the people of Hong Kong had moved well beyond the scramble for economic survival and were not, as they were characterised, simply ‘only interested in money’. Evidence that this was so was perfectly clear but ignored. Hong Kong people had poured into the streets in their hundred of thousands to protest against the 1989 massacre of the Chinese democracy protestors, political parties were springing up, neighbourhood associations were proliferating, lively political debate gripped the radio airwaves and so on. Even more alarming, for those who wished to maintain the myth that Hong Kong people had no interest in politics, was the rise of the so-called Post 1980’s Generation who came to prominence in the last decade and took to the streets and the Internet in great numbers to air their grievances and assert the need for better governance. They also, rather significantly, reflected a backlash against the tycoons who have held such a stranglehold on government attention. The upshot of all this has been a floundering government, rising civil discontent and a growing sense of cynicism, at times so profound that many people have expressed greater confidence in the Communist Party than in the local headless chickens clucking around the soon to be replaced government headquarters in Lower Albert Road. Meanwhile many of Hong Kong’s strengths remain in place. There is still a high degree of personal liberty and the rule of law prevails despite very worrying attacks on the legal system from Tsang, among others, who have expressed discontent over the right of citizens to use legal means to thwart government plans. On the other hand it is becoming increasingly clear that the government’s fabled claim to have brought prosperity to Hong Kong is something of a sham as the wealth gap widens into a chasm and no less than around 20 percent of the population subsists on the poverty line. Even those who are better off, but far from rich, struggle to buy their own homes or inch their way to membership of a comfortable middle class existence because government policies are so skewed in favour of the rich at the expense of everyone else. Hong Kong is far from being near a boiling point where discontent will erupt in worrying and unpredictable ways but what modern history teaches us is that eruptions of discontent are very hard to predict and no one can really identify the trigger points. All we know is that over on the other side of the border political repression is growing and China is becoming a far more assertive member of the international community and is able and quite definitely willing to brush aside any hint of foreign criticism of what happens within its own borders. Hong Kong’s reason for being for almost two centuries has been to service other places – the British used it as a transit point for the opium trade among other things and even under British rule Hong Kong was a gateway to the Chinese mainland. The former colony remains a gateway of kinds, mainly in the financial sector, and it serves a number of other functions, which are useful to China. However Hong Kong is also home to some seven million people with a distinctive identity. There is something rather undignified about viewing a population purely in terms of how useful they are to others. Hong Kong people rightly desire to be useful to themselves and are certainly quite capable of ruling themselves. But the door to democratic government has been firmly blocked, most ardently by those who benefit from things staying as they are. But nothing is forever and history shows that Hong Kong has thrived, not despite but because of change, so the question is: will change now be for the better or will resistance to change produce something quite the opposite? Stephen Vines is a Hong Kong based journalist, writer and businessman. He is the presenter of a weekly current affairs television programme – The Pulse – broadcast in HK and is a commentator with newspapers and a number of international radio and TV stations. Vines was the Deputy Business Editor of The Observer and has worked for the The Guardian, The Independent, The Daily Telegraph and the New York-based Daily Deal. He is the author of a number of books including Hong Kong: China’s New Colony and a study of the Asian financial crisis called The Years of Living Dangerously. His latest book, Market Panic was republished in 2008. Stephen Vines was the founding Chief Editor of Eastern Express, a mould-breaking daily newspaper published in Hong Kong. He was also a founder and publisher of the satirical Spike magazine. Great essay and provocative. But isn't Hong Kong now part of China? What China wants, it takes. It would be inconceivable for Oxford say to declare itself sovereign and set up a government completely at odds with the British Parliament. everyone thought it was all over in 1997. hk has survived! what's the big deal? why does everyone see china's dark shadow everywhere? hk will survive and prosper and a lot of this will be due to china. that's a fact. Despite anything the government may be doing to pass on control of the territory to China, it remains well ahead of Singapore when it comes to freedom of speech and association. My question is for how long? Excellent piece and well informed. But if Hong Kong has so much to lose, why is the government giving it all away in such haste? It sends a clear signal of where the city may be 10 or 20 years from now. Should expatriates like me be alarmed and consider a move to Singapore despite their muzzled press?